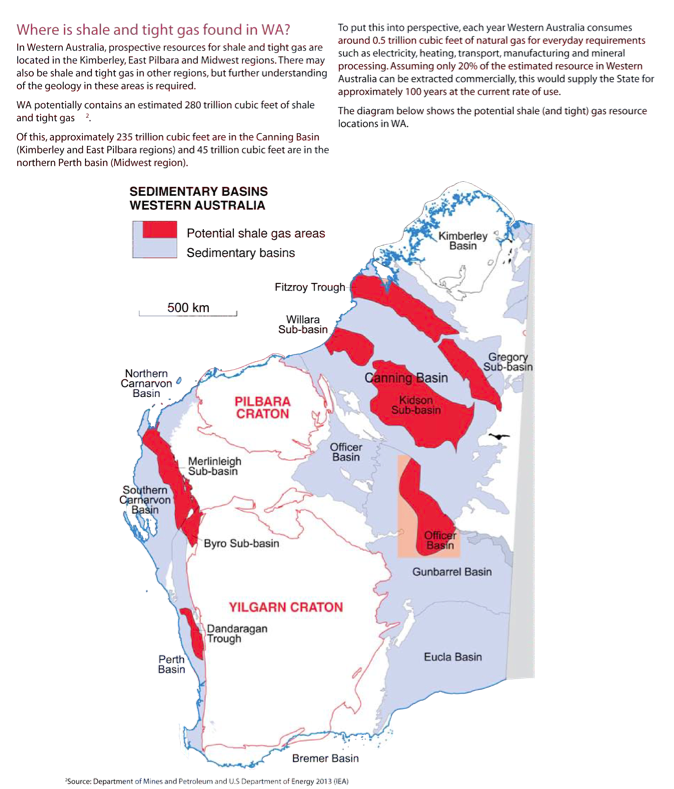 « Of this, approximately 235 trillion cubic feet are in the Canning Basin (Kimberley and East Pilbara regions) and 45 trillion cubic feet are in the northern Perth basin (Midwest region). If 280 tcf represent 100 years’ consumption in WA ( that is 2,8 tcf/year) then 235 tcf represent 84 years. A / that only 14% of the resource announced by the IEA can be mobilized. But today it is acknowledged that the estimates have been greatly overvalued and even that the 14% is incorrect. As proof of this, the fact that all the American companies have abandoned their licences and gone home empty-handed. B / mobilized as the resource it is possible to rise to the surface as about 10%. Indeed, the experience of 30 years of shale gas in the USA teaches that 90% of the gas remains in the basement, with maximum extraction time of the first year, decreasing dramatically the next two, and almost to zero after 8 years. 10% OF 235 TCF IS ONLY 23.25 TCF, SO A LITTLE MORE THAN 8 YEARS’ NATIONAL CONSUMPTION. NO MORE. Considering that the potentially exploitable surface km2 255,455 represents just under half of the Canning Basin, exploitable quantities can still beings dropped by half, or 1.65 instead of 3.29 tcf tcf representing barely 7 months consumption WA. « The 2015 evaluation program will involve larger fracture stimulation programs and extended flow tests to ascertain the long-term deliverability The Goldwyer Shale, which lies below the Laurel Formation, is also being pursued as a liquids-rich resource play Buru’s independent resource estimate puts a net 7.2 Tcf of gas and 4 billion barrels of oil in its acreage ». To confirm this, a recent report by Buru Energy of September 10, 2015 (page 10) shows the following figures “Laurel Tight Gas Regional resource: • + 100 TCF in the BCGS and + 1Bn bbls oil (gross) – with 47 TCF gas net to Buru (** independent Estimates of prospective resources) “. 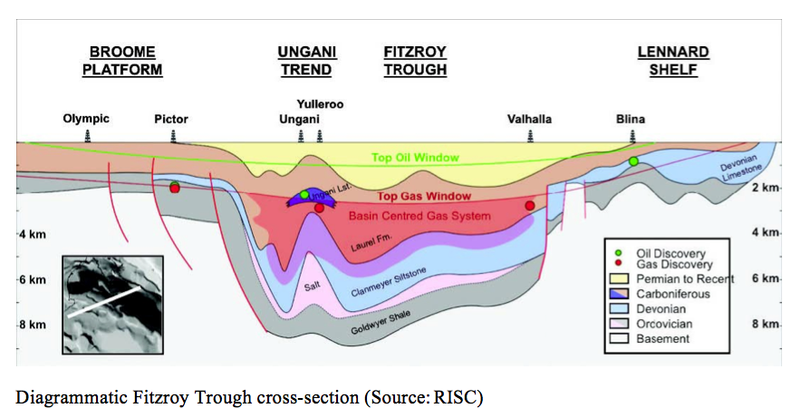 This report indicates Buru Energy’s operating area of 45 000 km2, slightly less than half of Fitzroy through Gregory + Sub Basin (109,886 km2 in the table below -Dessus). In fact, Buru Energy is considering a low estimate of 12 tcf product, which is close to the estimate made in relation to the Netherlands (EIA overestimated figures about 7 times). We see that these two articles confirm what is happening in Holland, and the corrected numbers that we propose. The Buru Energy’s figures will be even lower, as they occur on the assumption of 12 TCF fact that 10% of the resource -either 1.2 TCF, given the decline in production by 90% by the end of the first year for each year. This rapid decline in production is compensated by a second fracturing and well up to 15-20 fracturing, with a record of 42 fractures in the Dakota. Each fracturing consumes 20 000m3 of water … or four Olympic swimming pools of 5000 m2 (in the case of the technique of multiple wells, these figures are to be multiplied by 10 minimum). A well on its life consumes 4 X 20 = 80 Olympic swimming pools fracturing. Is there not has alternatives to fossil resources? What is the impact on human health (air quality, water quality and land quality)? 1 / calculations based on the US experience, demonstrated by numerous official studies (particularly by the EPA) with regard to water availability estimated without qualitative consideration. These calculations are applied to the latest studies Buru Energy, State of WA, and 42 report for the 39th Australian Parliament. The amount of water required for the operation is 3400 GL / year (low case) and 10 218 GL / year (high scenario). It is respectively about a third of the annual streamflow of the Fitzroy River or the amount of water from Lake Argyle in low case and the annual flow of the Fitzroy River and the amount of water the Lake Argyle in the high case. 2/ (Chap.1 page 36) “Smaller groundwater developments (i.e. 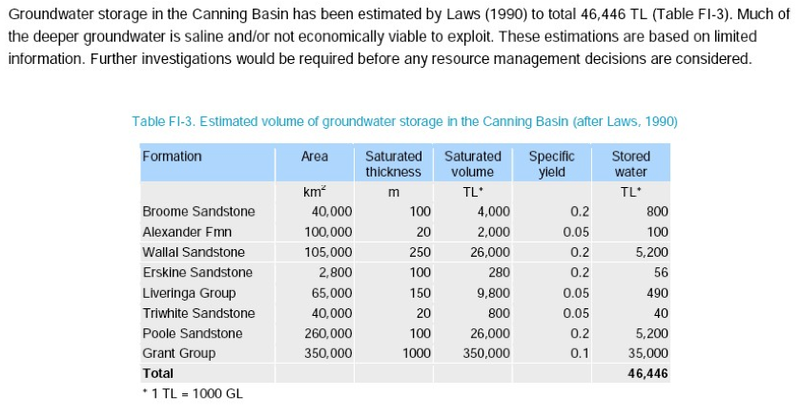 10 to 100 GL/year) are feasible within the aquifers of the Canning Basin, and have been developed in the protozoic carbonate aquifers in the Darling Rural Area. The latter, however, have also reached their extraction limit and there is currently a moratorium on any further groundwater development”. Finally, even if the volume of chemical is 1%, as these dangerous products pollute between 1,000 times 1 000 000 times their volume, the volume of contaminated water is 10 times to 10 000 times (depending on the product) the volume of water used. 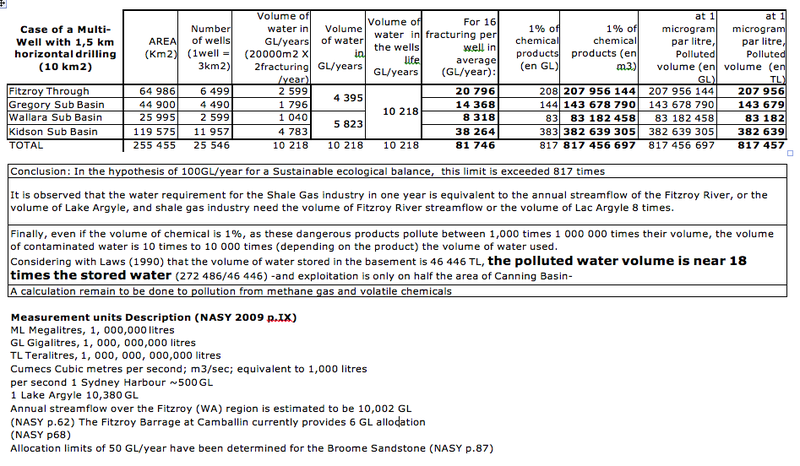 It is observed that the water requirement for the Shale Gas industry in one year is equivalent to the annual streamflow of the Fitzroy River, or the volume of Lake Argyle, and shale gas industry need the volume of Fitzroy River streamflow or the volume of Lac Argyle 8 times. As the migratory process of the polluted water and the gases is inevitable (in the very year of production, and for many years after the plugging of the wells) –see the 6 migratory processes described by the undisputed and official American EPA – this means widespread pollution of the Canning Basin. It is only a question of time, before the 90% of gas left in the widely fractured ground, and the 50% of injected water with the chemicals migrate up to the surface, polluting all the higher aquifers of fresh water. – The calculation of air pollution remains to be done; it is very great because of the cumulative releases of methane of both industrial and natural origin, which can exceed 100 to 1000 times the acceptable standards set by the US experience on extensive territories. The accidental emptying of a tank of methane to the north of Los Angeles has, since the end of October, 2015, caused the evacuation of several thousand families and the declaration of a state of emergency; the problem has still not been solved. 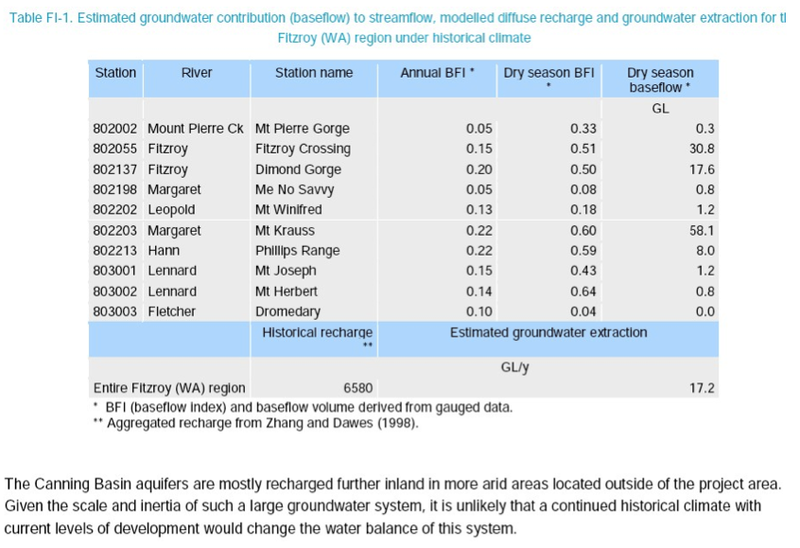 – The pollution of the water of the Canning Basin will affect the watershed of the Fitzroy River; so, the scientific studies to be carried out on the links between groundwater and surface water are essential, as highlighted by the CSIRO studies. And yet the Murray Darling Basin experience has shown clearly that an indiscriminate extraction of groundwater has resulted in a 90% loss of biodiversity, and the almost complete drying up of surface water in the dry season. Can we not learn from the experience of the Murray Darling Basin? – Scientific studies must also be carried out on the toxicity of the chemicals, which can pollute 10 to 10 000 times the volume of water used for the exploitation. Not forgetting the heavy metals and radio-active elements contained in these deep rock formations (radon, in particular ) which will affect the whole chain of production/distribution, from the well to the housewife’s gas cooker. The problems that will arise in the long run are not only the quantity of water available, but the quantity of water that can be used sustainably for different things and ultimately, knowing that this waste water is irreversibly lost because it is heavily polluted, the irresponsible wasting of this vital resource, which is being depleted by global warming, a depletion which they want to make even worse with these extractions. Why persist in looking for dangerous resources from the past when new, clean, renewable, sustainable energies exist? « Groundwater quality is good, but the available hydrogeological data are limited and the analysis of likely yields is very preliminary. A substantial investigation program consisting of aerial geophysical survey, investigation drilling and pumping tests will need to be carried out to define the extent and properties of the aquifers prior to confirming a sustainable extraction yield. 20.63 GL/year. These licences range from small community water supplies (<10 ML/year) to larger mining supplies (~4000 ML/year). They include the public water supply for Fitzroy Crossing (250 ML/year; DERMD, 2004), Camballin (50 ML/year; WRD, 2006), Derby 1500 ML/year; WRC, 2001a), Broome (4200 ML/year; WRC, 2001b) and 2359 ML/year for the La Grange area. 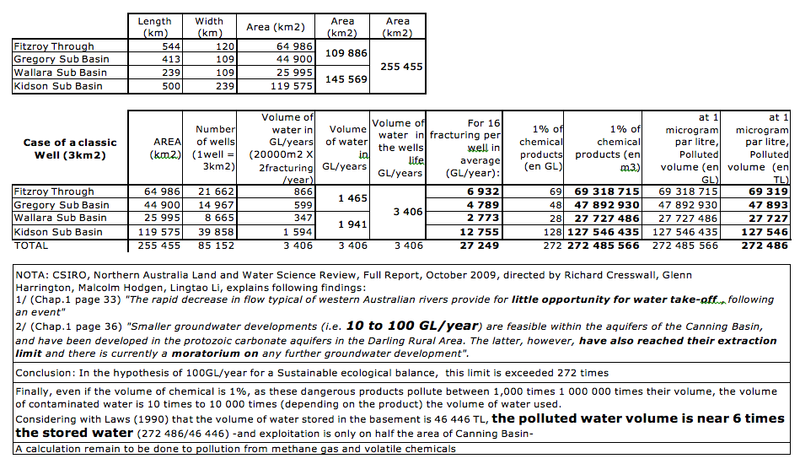 (Note that a further 3000 ML/year is licensed for extraction within the La Grange area outside of the Fitzroy (WA) region, DoW, 2008b). The majority of allocations are for taking water from the Canning Basin aquifers with few in the fractured rock aquifers in the north-east of the region and apparently none in the Fitzroy alluvial aquifer. Nevertheless, pumping from bores screened in aquifers below the Fitzroy alluvium (e.g. at Fitzroy Crossing) would likely have a direct influence on the water levels in the overlying alluvial aquifer ».